President stops short of emergency declaration in his renewed call for a wall on the southern U.S. border. 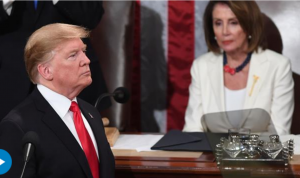 President Trump in his State of the Union on Tuesday renewed his call for a wall on the southern U.S. border, but without repeating his threats in recent weeks to declare an emergency, striking a less-rigid tone in his first address to a divided Congress. Mr. Trump, who spoke with Democratic House Speaker Nancy Pelosi and Vice President Mike Pence seated behind him, called for both parties to “work together, compromise and reach a deal” to pass a spending bill including funding for the project, but he suggested some flexibility on how long and what it would look like. If Congress fails to act, “I’ll get it built,” the president said.